Habitat includes humans, too. Our habitat includes the familiar – villages and rural communities, cities and suburbs. We are now at a point where we can develop these habitats in one of two ways. The old way, using resources as if they were limitless and disposing of them as if the earth’s capacity to mop up the waste was also limitless, or in a new way in which we use our ingenuity to limit this impact. The value is the same whether we are working with rich or poor communities. Earthship Biotecture is one outcome of this new thinking. Earthship Biotecture Europe (EBE) is a social enterprise set up to enable the further evolution of the Earthship building concept in Europe. We aim to inspire a fundamental change in the provision of basic needs. Shelter, water, power, food, warmth and stability can all be met by building in line with the earth’s systems. This is the only viable long term future for humanity. The Earthship is a powerful gateway to deliver this change. Our mission is to give people the inspiration, confidence and practical tools to go through this gateway and to realize Earthship projects. EBE was established by Michael Reynolds and Daren Howarth. Michael originated the concept and has overseen the design and construction of hundreds of Earthships, based around Taos, New Mexico. 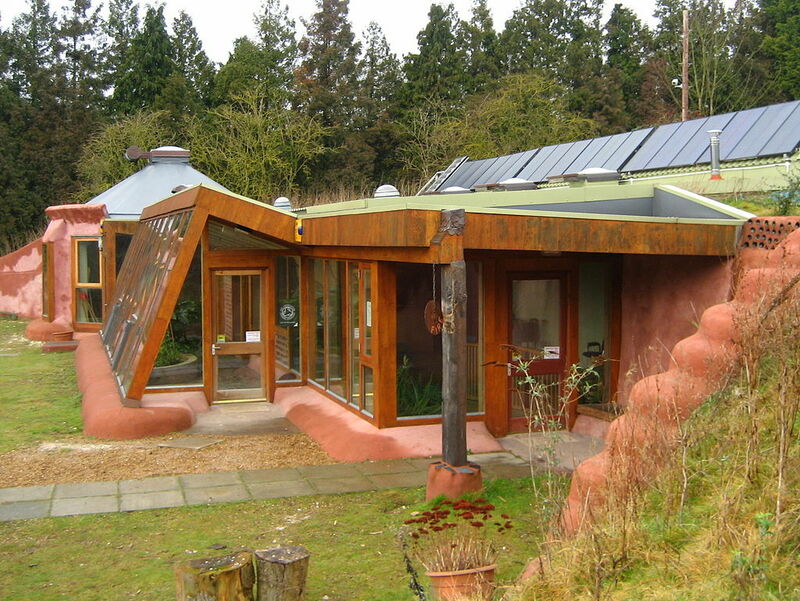 By 2000 the concept had evolved into a high performance, replicable building, and Daren began working with Michael to establish the Earthship concept in the UK and Europe. Earthships are solar independent buildings that heat and cool themselves, are self powered, harvest their own water and deal with their own waste. With free energy from the sun and free materials from waste, the Earthship is based on earth rammed tyre walls giving thermal mass to store heat. They are ‘heavyweight’ high quality buildings, designed with a comfortable low cost future in mind. They run free and yet can be realized at similar costs to the conventional utility dependant ‘lightweights’ that are currently proliferating. We need to reverse this balance – rapidly. Earthships fall within the larger category of Autonomous Buildings, that build on the work of 20th century visionary Buckminster Fuller.